One of my dreams in life was to wear a sassy pair of red-bottomed Louboutin shoes. I pictured myself the most fashionable school secretary in the country, flipping down the hallways, a blaze of red showing with each step. Off to the library I'd go, skirt swishing, heels clacking, bottoms flashing.... my shoes costing two weeks of my salary but no matter, the librarian is impressed. Then cancer slammed me like Hurricane Irene. And, chemo left my bones in wreckage like those shoreside homes you saw on the news, pilings every which way. 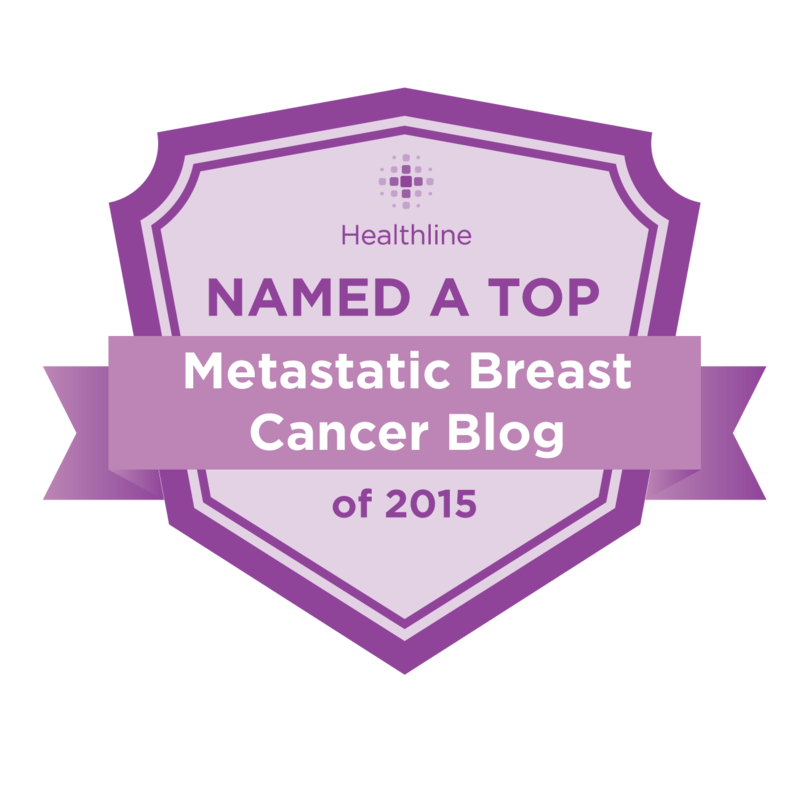 I became metastatic, and knew my dreams, both large and small, were coming to an end. During this time when I might finally decide to splurge on a pair of extremely expensive shoes - a time when you know you have to make these dreams come true or you'll never get them - well, shoes hurt now. Fashionista Ann, who could wear a different outfit every day of the year, and has a hundred pairs of shoes with five inch heels to match, has taken to wearing slippers and sweats out of the house. There is too much discomfort in my hips and knees to walk around in any kind of heels these days. And, I have no place to go any more, as I had to give up my job and most activities. I have no energy or appetite for meals out. Combine that with a kid approaching college and you realize buying pricey shoes like Louboutins would be a waste of a dream. I still wanted to try some on though. And, just recently, to fulfill that dream, a kind friend lent me hers. So here it is! 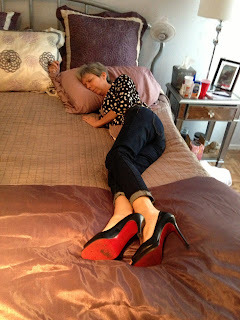 A day in the life of a metastatic cancer patient in her red-bottomed Louboutins. Getting my chemo, oh yeah. Cutest one in the infusion room. My exuberant puppy Trista welcomes me home. Steroids give me enough energy to cook! So you see, my friends, a gal can still wear her red-bottomed Louboutins doing household chores and going to chemo, just like the movie stars do. Here's the trick: carry them in a separate bag, wear slippers, and slip them on right before the flash goes off! Thank you to J. Nathan Higdon and Trenia for allowing me to have this much fun! I love it. You might need a feather boa to go with them! I've had a hellish day at work and those pics of you just made my day!!! Absolutely priceless! Hope that you're feeling better and it was just another case of c.diff for you (ick). You are so funny, Ann! Hey is that A-hole Book you're reading any good? I wonder if anyone I know is in it LOL. Take care woman! I did notice the book and laughed as hard at that as I did the look on Trista's face as you sprawled on the couch in your fancy shoes. I agree. You need a boa. Thanks. I wanted to keep it simple, but the people who lent me the shoes have never even met me. One is a facebook follower/friend but I've never met him, and I don't think the woman who owns the shoes even reads the blog or likes me on facebook or anything. I'll write about it later, but some stranger trusted me with $800.00 shoes without knowing a thing about me. People are remarkable. Truly. Cancer taught me one thing - how kind the human race is. You are so cute and I am so glad you got to wear those Louboutins! I've always liked them too! Mamacita - your fashion sense sets off those KILLER shoes so gorgeously. What did the chemo nurses think? And do the testosterone spreaders in your house get how incredibly AWESOME this is? All the chemo nurses came to see them. A few had never heard of them and there was lots of oohing and awwing of them.... and the price.......but one corrected my pronunciation - I was saying it wrong! :) Not only that, she is a shoe fan. She has some and said she had to sell some shoes to help pay her way through college. She loves shoes! There were quite a few pictures taken and it was another fun day in the chemo infusion room. :) I liked the one with the red bottoms showing in front so I picked that. Where is the Love Button. I know what you mean about shoes. I'm down to gym shoes and old lady Naturalizer shoes. You looked really cute and totally rocked those shoes. I love your attitude!! You rock those nice shoes! I just booked something from my bucket list too -- a trip to hawaii! We Gemzar gals gotta keep on, right? I LONG for a pair of Loubies.... I LOVE this post! and I love you!!! Great Pictures and amazing internet pals helping you out!! I hate that I enjoy your blog because I hate you are writing for the reason it came to be. You go, girl! It's good to see you smile. (And yes, I noticed what you are reading). It would be wrong to point out that if you claimed some obscure toe fungus you could probably keep those shoes, wouldn't it? Toni, email me at butdoctorihatepink AT gmail.com. I will do my best to help you. When is your scan? Hi Amy. Don't apologize to me, you have been busy doing the impossible. Weren't the crew wonderful? They made it so easy to share what our experience is like. Well, not physically easy.... :) But emotionally. They did a great job too, I'm very grateful to them. I think people need to know what we go through - in all flavors - and I'm glad your story was told. Here is hoping Joel is doing okay, as is your family. You are remarkable people. I have often said "better me than one of my kids" and I can only imagine your strength. But I also know that when you have no choice, you have no choice. You just do it.